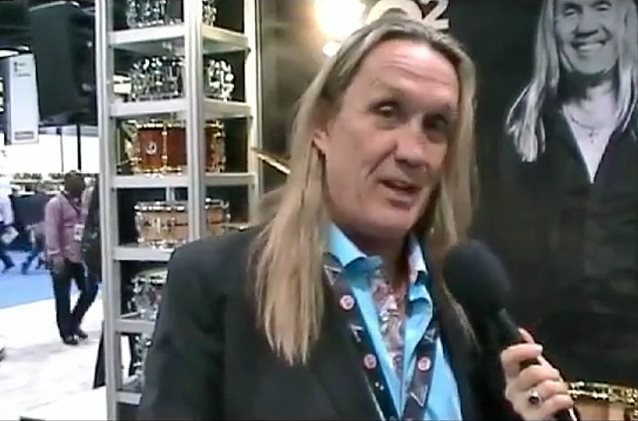 Metal Shock Finland conducted an interview with IRON MAIDEN drummer Nicko McBrain at this year's NAMM show, which took place January 22-24 in Anaheim, California. You can now watch the chat below. A couple of excerpts follow (transcribed by BLABBERMOUTH.NET). Nicko: "I left [Sonor] in '92 and went with Premier, and, unfortunately, business-wise, things didn't work out for the brand, Premier, and I was basically left without a drum company in the middle of last year. So my first thought was, 'I've gotta speak to Karl-Heinz Menzel at Sonor and see if they'll take me back.' Because I've now kind of got my hat in my hand, going out begging, you know. So I called Karl and I told him what had happened. And he said, 'Look, we'd love to have a meeting with you.' And I went over in September. I flew over to Europe. My manager, Andy Taylor, and I, we went over and spent the night there in Bad Berleburg [Germany] and we just talked… And the weirdest thing about it, or the greatest thing about it, was that it was as though I'd never been away. And we're talking over two decades. And we sat down and Karl said, 'What do you want?' I said, 'Exactly what I had twenty-two years ago: same sizes, same wood.' But there's something very, very special that they've done for me on this drum kit, which I can't really tell you about, because… Well, it's gonna be revealed at the first show, and it's an absolutely splendid, spectacular drum set. I think it's probably gonna top the 'Somewhere In Time' kit, which was made… And that's thirty years ago that Karl actually made that drum set for me; he, basically, had hands on building that drum set. So it was wonderful. So I'm really blessed to be able to feel this bond I still have with the brand. And I'm back. And I'm very happy. Very, very happy." Nicko: "Every album we make is the best album we've ever made. Because it's a time capsule. I've always said, 'It's the best album we've ever made. It's the best album we've ever made.' Well, this is definitely the best album we've ever made. If not in terms of people's interpretations of the music, saying, 'Oh, 'The Number Of The Beast' was better than that, and this and that and the other.' You have your favorites, right? It was in terms of the way we made it and the bond that we had. After all these years in the studio making records together, we had the best fun in William Tell studio in Paris to do this record. Every time we finished a track, we would sit back, all of us in the control room, and critique everybody's playing. Whereas before, we'd sort of go, 'Oh, that sounds good, doesn't it?' And Steve [Harris, bass] and Kevin [Shirley, producer] and Bruce [Dickinson, vocals] would kind of sort things out and go, 'Let's do that. Let's do that bit again.' We all had a hand on what we wanted to hear in the finished backtrack. The mix was down to Kevin and Harry, but we had so much fun. 'Cause we wrote in the studio as well, which is the first time we've ever actually done that. We have written songs in the studio — like when you go in to do an album and you've only got six tracks out of nine and you've gotta write three songs on the way. But this is… The whole album was written in the studio. And we had the greatest time. And what a great studio as well." "The Book Of Souls" debuted at No. 4 on The Billboard 200, having shifted 75,000 equivalent album units in the week ending September 10, 2015. That equaled MAIDEN's highest rank ever, first achieved with 2010's "The Final Frontier". In terms of pure album sales, "The Book Of Souls" landed at No. 3 on the Top Album Sales chart with first-week sales of 74,000 copies. This marked MAIDEN's best sales week since Nielsen Music started tracking sales in 1991. Released globally on September 4, 2015 through Parlophone Records (Sanctuary Copyrights/BMG in the U.S.), "The Book Of Souls" was recorded in Paris, France with producer Kevin "Caveman" Shirley in late 2014, with the finishing touches added last year. IRON MAIDEN announced in May 2015 that touring plans to support the album wouldn't happen until 2016 to allow singer Bruce Dickinson time to fully recuperate after his successful cancer treatment.